When I was young my grandparents owned a holiday house that our family made use of at least twice a year, particularly during summer. The house was pretty old, the beds weren’t very comfortable and worst of all there was no television. In spite of this I always looked forward to holidays there. The house was in Rye on the Mornington Peninsula between Rosebud and Sorrento, and I have fond memories of beaching, fish & chips and the summer carnival. They sold the house when I was in my early teens and suddenly there was a hole in my heart where those experiences used to be. Once I became interested in wine that hole was filled in a different way when I discovered it as a wine region. Over the years I was introduced to many other wines and regions in Australia, especially in the Yarra Valley where I worked for quite a while, but Mornington always remained my favourite region in Australia. So it seems fitting that the first region I visited since my return was to the Mornington Peninsula. The Sunday of the Labour Day Holiday in Victoria I drove down to Mornington from Melbourne to collect my cellar-hopping cohort. The last winery I visited in France on my trip was in Beaujolais and it was to Domaine du Vissoux, owned by the Chermette family. When I was there I was delighted when Pierre-Marie told me that not only would his son Jean-Etienne (Jet) be working vintage in Australia, but it would be in the Mornington Peninsula with one of the most important producers. Having returned I was really happy to take Jet to some of my favourites down there as well as a few I hadn’t visited before. First on the agenda was Eldridge Estate which we were visiting for two particular reasons. The first reason was because David Lloyd established it back in the ’80s when the region was still very young, and works on a small property with care, attention and specific clonal selection. The second reason was because he is one of the only growers in the country to work with gamay, the key grape variety of Beaujolais where Jet is from. 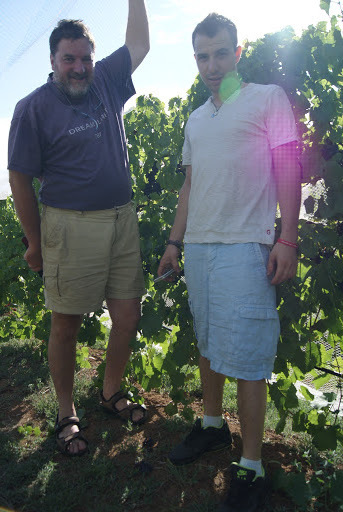 David was very glad to meet Jet as he is very familiar with the Chermette family, and he was also glad to show him the 20+ year old gamay vines, laden with fruit approaching ripeness. Eldridge Estate is located on the northern side of the peninsula in Main Ridge. Whilst there is more exposition to the sun it is actually a much cooler part of the region thanks in part to the elevation and the cool breezes coming off Port Phillip Bay. As such the harvest is later here than it a lot of other places on the Peninsula. Things have been pretty hot the last few weeks of the 2013 vintage, and if wineries haven’t already started harvesting then they will very soon. With a protracted heat wave fruit ripens faster, plus different varieties and parcels ripen at roughly the same time, which can create problems for small wineries operating on skeleton teams when they can’t find people to help them harvest. David is finding himself in this situation with only a few hectares of vines, an unfortunately very ill wife and unsure if long-time friends will be available. Young Jean-Etienne very graciously offered to help on one of his days off if he could. When it is this hot there is only one way to serve gamay; lightly chilled. David also showed us some of his other wines made from chardonnay and pinot noir. Click here to read my tasting notes. The second winery we visited is owned by the family who established the one that Jet is working vintage at, Kooyong Estate. 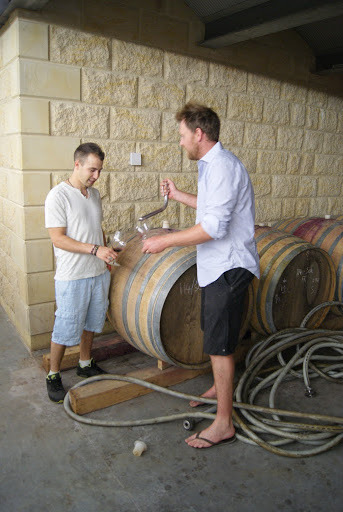 A few years ago the Aylward family sold the business that they had taken from inception in 1997 to become one of the most important wineries in the Mornington Peninsula along with winemaker Sandro Mosele. With the money they received they decided to establish a new winery called Ocean Eight located in Shoreham, tucked away on an unsealed road. Whilst the winery is on the family property only a few hectares of vines are planted to predominantly pinot gris. 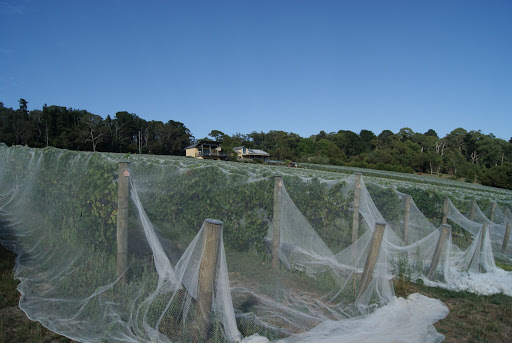 Most of the fruit comes from the 17 hectare vineyard in Moorooduc planted to pinot noir and chardonnay, and this is transported to the winery from which they make a small range of wines. Having worked under Sandro for many years the winemaking was taken up by Michael Aylward who met Jet and I in the throes of harvest. Mike showed us the modest climate-controlled winery which was converted from a stable when the family decided to get back into the industry. 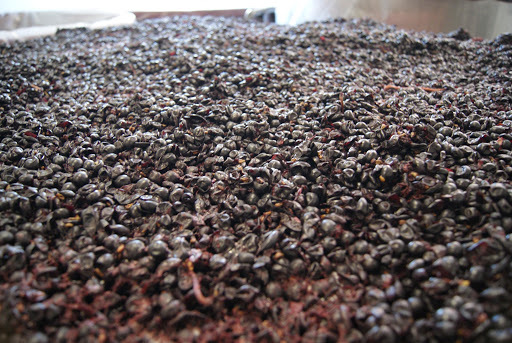 More than a few open top fermenters were filled with different batches of pinot noir sitting on skins and extracting colour and tannins. Plunging is performed at least once a day during the fermentation by hand which is not an easy job with such thick caps. The yields are extremely low which generally means a much higher skin to juice ratio. The pinot gris had been pressed hard to extract more phenolic compounds to add texture and depth, and it was already fermenting on the lees solids without filtration in barrels. Down in the cellar Mike gave us a taste of a few different barrels of pinot noir from the 2012 vintage that are approaching the end of their maturation and will soon go into bottle. Mike prefers a fairly soft touch in the winery, preferring the hard work to remain out in the vineyards to produce higher quality. One of the keys to maintaining acidity in the wines is to harvest a little earlier than many others in the region. This means that a higher level of malo-lactic fermentation is beneficial for the chardonnay to take the edge off rather than making the wine too fat and buttery with riper fruit. Mike then showed us some of the current releases in bottle, and you can see my tasting notes here. 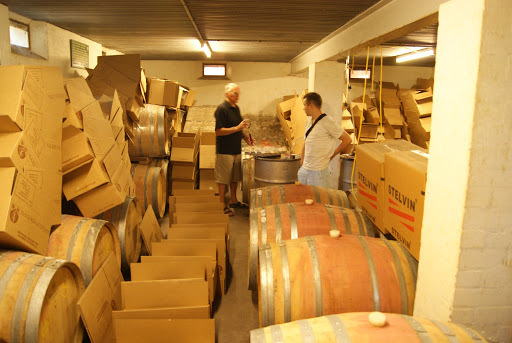 I had been a follower of the third winery we visited for many years having sold and bought them in the past, particularly since the 2008 vintage when a new winemaker was appointed. The owners of Yabby Lake are the Kirby family and it is one of three estates in different parts of Victoria. After making a huge impact with Yering Station in the Yarra Valley Tom Carson was appointed as the Chief Winemaker for the group and also the General Manager. 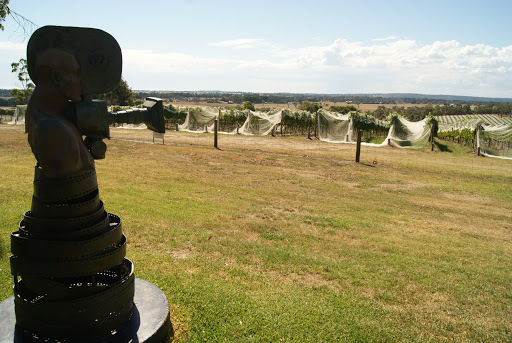 The winery itself is located a few hours north of Melbourne at their Heathcote Estate vineyard. Their first Mornington vineyard was planted in 1992 in Main Ridge, and the Yabby Lake vineyard was planted in 1998 in Moorooduc, a year before their Heathcote vineyard which was followed by their Strathbogie property. The same year that Tom took over as GM the children of Robert and Mem Kirby took over the business which has evolved significantly since then. The range has grown at the bottom and top end, and Tom has been garnering a lot of attention for the increased quality. 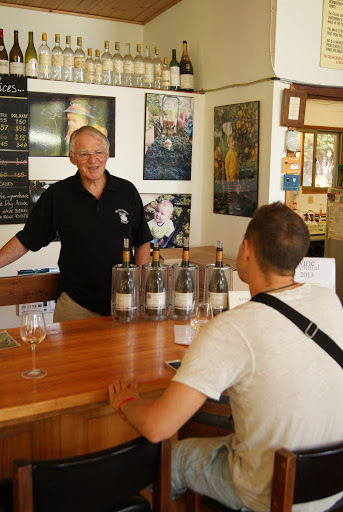 Unfortunately Tom was busy with vintage up in Heathcote and wasn’t at the new cellar door in Mornington, but we were able to taste through a number of the wines anyway. Click here to read my tasting notes. The winery I was probably most excited to introduce Jet to is in my opinion the most important and historic, and also happens to be my favourite winery in the world. Main Ridge Estate was planted by Nat and Rosalie White in 1975, making it the first commercial vineyard in the Mornington Peninsula. Pioneers in every sense of the word, they were inspired by a one-year excursion across many of the great wine regions of France in their early twenties. Over a number of years they planted three hectares which contrary to almost every vineyard in Australia hasn’t grown since then. Back in the 1970s barely anyone had even heard of pinot noir and chardonnay, and even in the ten years after they established most of the vineyards planted in Mornington were to riesling and cabernet sauvignon, now considered to be totally inappropriate for most of the region. Nat was one of the first graduates of the newly formed Bachelor of Applied (Wine) Science with Charles Sturt University, co-founded by an old boss of mine in Dr. Tony Jordan. The first vintage was in 1980 and amazingly little has changed in their practices, philosophies or quality; they have been within the top 1% in Australia ever since. The first time I visited the region for wine tasting purposes was in 2005 with my cousin, and Main Ridge was undoubtedly the highlight of the six wineries we managed to hit. Ever since then I have had a love affair with their wines, and this visit was my fourth. Every time I make it there I have bought wines, and I also bought whatever I could on the secondary market. They only sell privately through the cellar door and mailing list, not utilising a distributor as it is not necessary and they don’t make a lot. It was with some disappointment I discovered that not only did they not have any of their iconic Half Acre Pinot Noir available for tasting, they didn’t even have any for sale. Even worse was that there would be even smaller volumes in upcoming releases, with the 2011 vintage not meeting their very high standards and being discarded. As it is one of the coolest parts of the region they can harvest later, and the slower ripening of the fruit means it is very elegant with good natural acidity, and the right level of ripeness. Limited amounts of new oak are used for the pinot noir and chardonnay, thus keeping the fruit character very bright and fresh when the wine is released. Better than anyone else on the peninsula they know how well the wines age, particularly since they converted completely to screw-cap since the 2002 vintage. Nat showed Jet and I a couple of barrels in the cellars which look amazing, but for the current release wines you can read my tasting notes here. 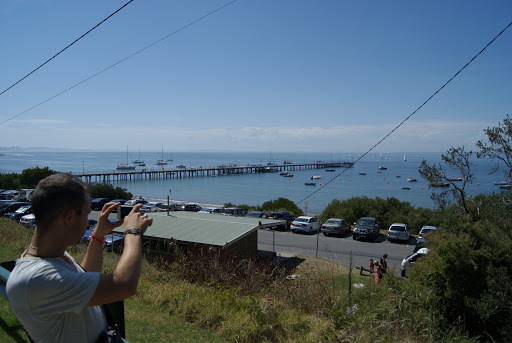 Click here to see more photos from my day in the Mornington Peninsula.